The Law Offices of Barry T. Simons is dedicated to fighting DUI cases. Our attorneys are specially trained and educated in the unique aspects of DUI defense. Our office maintains the highest standards of continuing education possible to bring you the most up-to-date scientific knowledge and legal skill to defend DUI cases all across Southern California. Unlike many attorneys, we will not only challenge the Courts of the State of California, but also the Department of Motor Vehicles. The preservation of your license is vital. Specializing in DUI Defense in Orange County, California , Barry T. Simons is a nationally recognized expert in DUI Defense. Mr. Simons has spent the last 40 years specializing in defending DUI cases in all the Courts throughout Orange County, California . The Law Offices of Barry T. Simons has been and continues to provide DUI Defense for the residents of and persons arrested in Southern California . We aggressively defend DMV suspension actions and have been successful in overturning many improper actions taken in these proceedings. The Law Offices of Barry T. Simons is a true "firm," not just a collection of attorneys sharing an office. This means that a person who hires our firm to defend his/her DUI case is hiring a team of lawyers, paralegals, experts and investigators who collaborate to recognize legal issues, develop strategies and work together for the best result. To get to know each of our team members better, please click a name below. Mr. Simons has been a criminal defense lawyer in Orange County for over 40 years. Mr. Simons has presented his cases and lectured at seminars all over the country, including the highly specialized intensive DUI program presented by the National College for DUI Defense on subjects including scientific evidence, legal motions, DMV practice and procedure, and the interstate implications of DUI license suspensions. Over the last several years, he has successfully challenged the Irvine Police Department's practice of compelling blood tests from DUI arrestees in Nelson v. City of Irvine in the 9th Circuit Federal Court of Appeals. This case established for the first time that an arrestee has a constitutional right to choose between a blood test and a breath test and that police cannot compel a blood test from a driver who wants a breath test except under unusual circumstances. Mr. Simons is also the former President of the South Orange County Bar Association and served on the Board Of Directors of the Orange County Bar Association. He is a Founding Member and current Regent of the National College of DUI Defense and a Member of the Board of Directors of the Association of California Deuce Defenders. He is also co-author of California Drunk Driving Law, often considered the Bible of DUI Defense. NOTE: Mr. Simons's full resume is too voluminous to be included in a such a short summary. For Mr. Simons's full resume, please click here: resume. Attorney Alan Castillo is a former Orange County Deputy Public Defender. Mr. Castillo was also formerly an attorney on multiple International Law cases with the American Civil Liberties Union. Prior to joining the Law Office of Barry T. Simons in 2000, Mr. Castillo excelled in the practice of Criminal Defense Law in one of the most conservative counties west of the Mississippi: Orange County. Mr. Castillo has conducted well over 100 jury trials in the course of his seventeen year legal career. He has worked on several cases before the United States Supreme Court, including United States of America v. Alvarez-Machain and Alvarez-Machain v. Sosa, et al. (i.e. U.S. Government). Mr. Castillo has participated in legal writings before the Federal Ninth Circuit Court of Appeal and the U.S. Supreme Court. In addition, he has participated in Federal Civil cases before the U.S. District Court in the City of Los Angeles. As a Criminal Defense Attorney in the County of Orange, Mr. Castillo has successfully tried cases to Not Guilty Verdicts in DUI, domestic violence, sexual assault and molestation cases, assault and battery, assault with a deadly weapon, possession of drugs, possession of drugs with the intent to sell, and a variety of other misdemeanor and felony matters. Mr. Castillo is a Contributing Editor to the California Drunk Driving Law and has lectured at several seminars throughout the State of California and the country on how to conduct DMV Administrative Per Se hearings, as well as how to handle DUI matters in criminal court. Mr. Castillo has also lectured before the California DUI Lawyer's Association seminars in the City of San Francisco and Los Angeles. Mr. Castillo has a reputation for being an aggressive, hard-nosed, criminal defense attorney. As an Orange County resident and Orange County practicing criminal defense lawyer for the last seventeen years, Mr. Castillo has developed close relationships with members of the Orange County District Attorney's Office as well as Judges, Commissioners, and other influential figures in the Orange County Superior Court system. Mr. Castillo represents doctors, lawyers, judges, athletes, and many other individuals in the community. Attorney Marlo Cordero is a graduate of Claremont McKenna College and George Washington University Law School. She has handled over 1000 DUI cases including DMV administrative hearings and writs and appeals of erroneous DMV decisions. Ms. Cordero is a Contributing Editor to the California Drunk Driving Law. Ms. Cordero utilizes DMV Hearings to not only fight to protect your driving privileges, but also to develop DUI defense strategies that will work for you in the defense of your DUI case in Court. Ms. Cordero has dealt with a multitude of search and seizure issues and will research and investigate your case and challenge improper police practices and faulty science through pre-trial motions and up to and including trial. Attorney Peter F. Iocona joined the Law Office of Barry T. Simons in November of 2000. Mr. Iocona is qualified in the proper administration of the Standardized Field Sobriety Tests (SFST) by the National Highway Traffic Safety Administration (NHTSA). 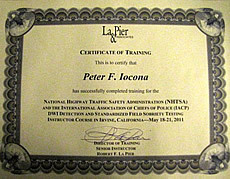 Mr. Iocona has also qualified as an Instructor in the proper administration and instruction of the Standardized Field Sobriety Tests (SFST) by the National Highway Traffic Safety Administration (NHTSA). Mr. Iocona has also been certified on the proper use, administration and calibration of the Alco-Sensor IV, one of the breath testing devices used in Orange County. Mr. Iocona is a Contributing Editor to the two volume treatise: California Drunk Driving Law, often considered the "Bible of Drunk Driving Law" in the State of California. Mr. Iocona writes and speaks extensively on DMV APS hearings, Writs and Appeals, Search and Seizure, Interstate Driver's License Consequences, DUI Drugs and other DUI defense topics. Mr. Iocona is a member of the National College for DUI Defense (NCDD), the California DUI Lawyer's Association (CDLA), California Association for Criminal Justice (CACJ) and Orange County Bar Association (OCBA). As a member of these organizations, Mr. Iocona has received specialized training in the defense of those charged with Driving Under the Influence (DUI). This training is imperative to his ability to defend those charged with DUI. It is used extensively in the cross-examination of officers and forensic scientists in motins, at trial, and at DMV APS Hearings. Mr. Iocona has also received extensive training and instruction in the area of DUI Drugs, a new arena in DUI defense in light of the increasing rate of those being charged with DUI after consuming their prescription medications. Mr. Iocona has received Drug Recognition Expert instruction and served as an Expert Panelist for a seminar sponsored by the O.C. (Orange County) Crime Laboratory and the California Association of Toxicologists, entitled: DUI Drugs, Says Who? held in Anaheim, California. "DMV APS Hearings: What Still Works"
"Effectively Handling DMV APS Hearings & Writs and Appeals"
"DUI Drugs-To Quantitate or Not to Quantitate?" "When is One Qualified to Render an Opinion?" "Effectively Handling DMV APS Hearings"
Whether you were arrested for Driving Under the Influence in Costa Mesa or Orange, the authors of California Drunk Driving Law can provide you with the very best representation. After all, why hire a DUI lawyer who reads the Book on California Drunk Driving Law when you can hire the DUI Lawyers who write the Book on California Drunk Driving Law. If you were arrested for Driving Under the Influence in City in the County of Orange, such as Rancho Santa Margarita or Irvine, California, call the Law Office of Barry T. Simons today for a free consultation.